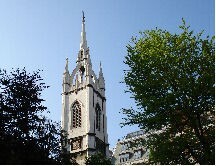 The church of St Dunstan in the East is located on St Dunstan's Hill, EC3. The original church was built around 1100 in the gothic style, but was severely damaged in the Great Fire of London. Rather than being completely rebuilt, the damaged church was patched up and a steeple, designed by Sir Christopher Wren, was added. This was unusual in that Wren designed it in the gothic style to match the old church. However, by the early 19th century the church was in a very poor state and was rebuilt by David Laing, with assistance by William Tite. Wren's steeple was retained in the new building. 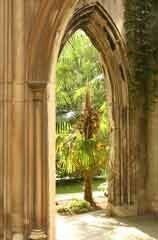 St Dunstan's was severely damaged during the Second World War, and it was decided not to rebuild the church. However, Wren's tower and steeple survived intact, and the tower and adjoining All Hallows House have been converted to residential use. Of the rest of the church only the north and south walls remain. The City of London Corporation has planted a lawn and trees within the ruins, and a fountain sits in the middle of the former nave, creating one of the most beautiful public gardens in the City. St Dunstan's is now part of the parish of All Hallows by the Tower and occasional open air gatherings are held in the gardens, such as on Palm Sunday prior to a procession to All Hallows along St Dunstan's Hill and Great Tower Street.